99% of businesses have KPIs. Those KPIs measure key conversion points for the business. Purchase, sign up, subscribe...etc. 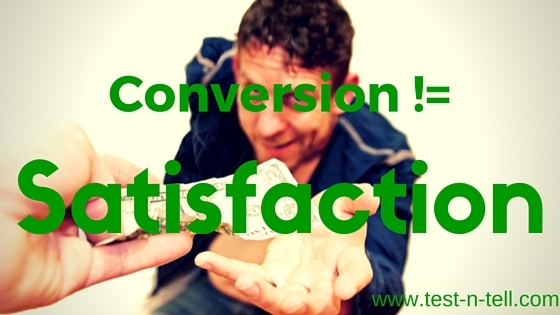 Those KPIs and conversion points are the holy cows of the business. If they going up - we're happy, if they drop - we have a problem. Guess what those KPIs usually don't include? That's right - they don't include user satisfaction. Those numbers can't reflect user emotions when using our product and therefore we loose a massive amount of crucial information. Are user emotions matter if they convert? They are if you want them to convert again. In a competitive market user, satisfaction is the key to a retention. In a non-competitive market - users might be forced to use your product and convert, but they will moan, cry and jump immediately to something else as soon as it appears. You start on your favourite aggregator site, like Kayak or Skyscanner. The interface is nice, so you can quickly and easily search for tickets you need. You've gotten the results, chosen the cheapest option and clicked "buy". You've been redirected to the airline website or a re-seller. Your route is already chosen as well as the rate. You insert your payment details, choose few extra options and in few minutes you've done. Tickets bought. You're reasonably satisfied, although nobody asked you about that. All participants of this process tracked your behaviour and calculated +1 to their KPIs. Search +1. Clicked "buy" +1. Came from aggregator +1. Bought ticket +1. Upsold an extra +1. Everybody is happy. You go to a train tickets aggregator (not that many of them exist anyway). The interface is ok, not great but within 10 minutes you manage to search and pick the route you need. You click "buy". It tells you: "you'll be re-directed to a railway company site and your shopping basket will be transferred as well". But it has not. You just land on their homepage. Now you need to search again. So you do. In a completely different interface. Another 10 minutes and you're getting to the point you've been. Route found, but the price is different than was on the aggregator site. Why? How can you get the price you've seen? You wonder around for some time and somehow found out that there are different types of a ticket... for some of them, the difference is just a couple of cents in price. WTF?! Have you just spent almost half an hour of your life to save a couple of cents? So you finally select the tickets you think suit you, still not being sure you're eligible for that fare. Finally, checkout page. "Sorry, this credit card is not supported". Aaaaaaa. You're calming down for some time, maybe take some pills and try again with a different card. Can it be? Did it work? You're not sure coz confirmation is not there yet. You wait. Wait a bit more. And finally, it arrives. Your tickets. You close this website promising to yourself that next time you'll go by plane. Of course, you're quick to share your "wonderful" experience with your friends and family. Yet for all participants of this process except you - it was all fine. Aggregator calculated +1 for you clicking "buy" and going to the railroad company site. Do they know that transferring of shopping basket didn't work? Probably not, coz they don't ask for it. The railroad company is happy coz you've bought tickets. For them, it's +1 to their KPIs. They don't know how many potential customers they've lost due to bad experience and dissatisfaction their current customers are having. Yes, there are no other places to buy railroad tickets online ....right now. But as soon as any alternative appears - their KPIs will drop big time. Additionally, user opinion about the aggregator from which she started the experience might suffer as well. A user usually does not care what website it was. User judges the entire experience. And if this experience was bad - all intermediate touch points will be rated as bad. What they could've done to prevent that is to ask a simple question after a customer purchases the tickets: are you satisfied by your experience? And then, of course, analyse the results. Coz that's what they don't know or forgot about: if user motivation is really high to perform certain behaviour - a user will get through almost any horrible experience. But as soon as motivation drops or a simpler alternative is available - a user is gone. You lost her. And all potential customers who heard her story. Measure your customer satisfaction! Do not just look at KPIs. It's easier than you think. Just place simple "how was your experience?" question after the key conversion points or actions of your product. Analyse the results, act accordingly and inform the user that you've improved. That user opinion didn't get unnoticed. This will pay off massively for you in the future.